I have an inset faceframe job coming up, Shaker style doors, to be painted in white conversion varnish. We had the conversation about whether to caulk or not to caulk the cabinet doors. We advocate for not caulking the doors because I have had several experiences in the past where the caulking cracked beneath the conversion varnish. Granted, the most recent version of this was on a dark green paint and an applied molding door. The joint between the molding and the panel developed multiple cracks exposing the white caulking in contrast to the dark paint. These were outsourced doors, so it's possible the moldings were not adequately glued or fastened. In this case, we will not have that issue. The frames will be poplar, the panels will be MDF. Part of that conversation centered around wood movement. It is a fact that a given percentage of frame and panel doors within a job will develop hairline cracks at the joint between the stile and the rail. This does not mean that the joint has failed, it just means that the conversion varnish did not have the elasticity to withstand the seasonal or functional movement of the door. These hairline cracks are almost imperceptible, and the only reason someone might notice them at all is because of the perfectly smooth nature of a spray applied finish on a wood door without any grain. In my office is a set of quartersawn white oak cabinets. I can feel, but cannot see, tiny little ridges in the finish at some of the joints where the varnish has sustained this same hairline crack over the years, yet the door integrity is fine and it remains stable. Unfortunately, the customer has now fixated on this conversation and is raising quite the concern over these cracking issues and is demanding that we warranty against all future cracking - at the door joints, between the frame and the panel, and at all faceframe joints. Adding to the problem is that these faceframes were designed by their architect to have 1" stiles and rails, which means we have room for only 1 pocket screw and will have limited gluing area. Even after having been glued to the case, I foresee that some of these faceframe joints might develop these same hairline cracks over time. So, I'm interested in the opinions of fellow cabinetmakers. Please provide your comments regarding wood movement, wood species, conversion varnish, caulking vs. no caulking, expectations, etc. I will probably end up sharing your opinions with my customer. The majority of our product line is traditional style flush inset cabinets. These cabinets are designed to emulate architectural details originally produced 100+ years ago. With the exception of some improvements we use essentially the same methods of construction that were used when the original cabinets were produced. It is only reasonable to expect that these cabinets will end up looking to some extent like the original ones do now, i.e, there will be manifestations of sag, warp & twist. The paint will no longer be perfect as the wood below the paint will continue to expand and contract with seasonal changes in humidity. The same conditions that make your back door sticky in the spring or your windshield fog up in the fall will cause your lumber in your door to move. You can't stop that from happening. What we focus on is mitigation. There is no way to expect any finish to be as resilient as the dynamic wood below it. For this reason all of our projects are brush finished on the final coat.Brush strokes mask the effects of wood movement and provide a mechanism for when (not if) the finish needs to be repaired in the future. Your architect should have explained this to the customer but this is probably not part of the curriculum at university. Not to hijack the thread, but Tim your brushing the final coat is really interesting. What finish do you use for this? Derek, sounds like a PITA. Maybe one-piece MDF on the CNC? Seems to me that 1" rails and stiles would look cheesy, but I'm obviously not an architect! Our cabinets are typically sprayed first and only the last coat is tipped with a brush. Usually this is done with Benjamin Moore Satin Impervo. This is available as an alkyd oil base. They also have a water based version. The two finishes dry differently so you have to pay attention to the environment you are working in. You want to minimize air flow with the water base as it can cause the paint to dry too quickly. We offer this kind of finish for a couple of reasons. The first reason is that it is intrinsically resilient. What I mean by that is that the brush strokes already mask the effect of wood movement. The second reason has to do with aesthetics. When you look at an old house the moldings are softer from a half dozen coats of paint. The finish isn't perfect. It's like a pair of slippers that are nicely broken in. If you were to look at a 1926 Model T pickup truck that had a paint job on it that looked like it came out of a Lexus factory it would disturb you. Something is not right with this picture. Like electronics, eventually all finish will fail. Ten percent of the door area receives 90% of the wear. Same thing with other high traffic areas. If you brush the finish initially you can repair it later. If you spray it there aren't any obvious solutions. Whenever anybody talks about a "maintenance free" finish what they are really saying is "there is no way to maintain this!" Wood: While poplar is an adequate choice for paint grade work and would suffice. On an inset job, especially where the client was worried about wood movement I would use a different wood- probably sap cherry would be my choice on a high end job. Alder & soft maple would pose the same problems as popular- too much movement. Hard maple would present joint problems on the 1" frame in my opinion. But stopping wood movement is not going to happen, you can only help to control it. Therefore, after weighing all the wood possibilities in close grained woods I would settle on stain grade cherry. 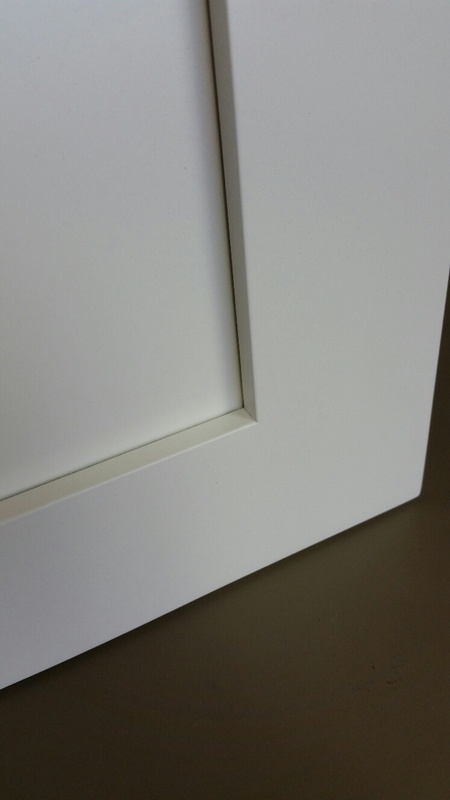 Caulk: with an mdf panel on a shaker door I do not foresee the caulk line cracking given proper dry time of caulk and proper humidity levels being kept during the construction of the cabinetry, the home DURING CONSTRUCTION and maintaining the humidity in the home. I have had CV react with the caulk though and seems to work better with a coat of vinyl over the caulk, before application of the CV (sandwiched between a normal coat of vinyl, sand, caulk, and light coat of vinyl). The CV tends to be a little hot for caulk in my opinion. My biggest concern with caulk is if it's a true shaker door with squared edge/shoulder, it's almost impossible to get out in the 4 corners of the door. A client worried about hairline cracks years from now would often be tough to satisfy- but the other option of not caulking would be just as unsightly. In my experience caulk needs to have a certain thickness to it to not crack which is why it takes so much time to "clean up" correctly- you have to have enough there to let it move but not so much as for it to be messy. So weighing all the options I would caulk, between coats of vinyl sealer and plan on spending days caulking doing the best cleanout possible of the corners for the expectations I know your clients demand. Conversion Varnish: By far the best product for a sprayed application (probably other than 2k poly- which is in a whole different league and price point). Any downside it has from not keeping up with wood movement is far outweighed by it's ability to withstand much more "abuse" from both knicks, scratches, chemicals, water and importantly yellowing. While Impervo is a good finish, it will not hold up as well in any of those situations (except the WB to yellowing)- nor does it lay down as flat. The look described as tipping/brushed is it's own unique look. A good luck, but completely different from a sprayed finish that will appear flawless. It is artistic and timeless, but it achieves it's success over flaws by initiating flaws from the beginning into the finish. This is not acceptable to many (while just as correctly highly prized by others) and really should be considered a separate finish more for historical work/look. Providing a reasonable warranty with your work is to be expected, but a demand for "all future cracking" is ridiculous. After all, this is a natural product subject to movement far beyond your control. As was pointed out, steps can be taken to mitigate the movement but it cannot be eliminated. If the client is insistent on an iron clad guarantee against any and all future cracking, point them to manufactured products such as mdf. We strive to produce quality products that will hold up to normal use and some abuse. Our warranty is for 1 year material and labor, but we've always been open to evaluating issues beyond that timeframe. Don't be afraid to walk away from clients you'll never please. You'll lose more in the long run. Do you ever discuss long-term maintenance issues with your customers? Assuming you can actually start with this pristine "perfect" finish, do you think it will hold up over time? Let's assume your "bullet proof" finish actually gets nicked by a bullet. What is "Plan B" on that day? I use both methods, tipping and flawless, depending on my clients desires and needs. The most common use for the tipping method is in a large condo unit in a resort town that are sold as weekly rentals. They are abused, and therefore touch-up is an important aspect for their maintenance department . However, we only wet our toes a half dozen times a year in Derek's market of truly high end kitchens. And to be perfectly honest, the majority of our clients in that market, do not subject our product to the abuse necessary to warrant such a finish- even if they wanted it (and most do not). Most folks understand things age, even the very best quality of things. You can garage the Bentley, have it washed and waxed weekly, give it it's regular maintence but the odometer still spins. The half syrup, organic chai latte still spills. The rock chip from the WSDOT dump truck still lands on the windshield. Doesn't mean they prefer to buy a rattle canned Bentley with an already chipped windshield just to negate future worries about such things. I'm a fanned of the tipped look, don't get me wrong. But I drive a 20 year old truck, live in a cabin and prefer antique shops to the mall. It has it's place but it only appeals to those who prefer the antique look OR those whom we can convince they should like the antique look. How do you fix a sprayed finish? Do you make your customer aware of the limitations inherent in sprayed finishes or is something that doesn't get discussed? Although your question was directed to Robert, I will respond as well. All we spray is conversion varnish, and it's been that way for many years. Consequently, we have hundreds of jobs out there in both stain and paint, in both full overlay frameless and flush inset faceframe styles. The "incident" you are talking about doesn't take long to occur, in fact it usually occurs before the cabinets even make it into the house. By the time these large scale projects are ready for occupancy, there are typically dozens if not hundreds of flaws that need to be addressed, the result of dozens of tradesman crawling in, on, around, over and under our product. We have a specific line item for this now called "on site touchup", the result of many years of eating this expense ourselves. It goes on to say that this cost is merely an estimate, that the actual cost will be determined by how picky the owner wants to be. The process we have settled on is airbrushing. Sometimes minor filling is required, and on rare occasion it may even require painting out a whole side panel or box face to achieve an acceptable blend. But most of the time we just airbrush a dot over the impact point and it blends away. You might shake your head at all this, but I would estimate that of my paint grade customers, only perhaps 1 in 50 entertains the idea of having brush marks on their cabinets. So does the discussion about longevity of finish take place when you discuss the line item for "on-site touch up"? Do your customers conclude the root cause for these defects is simply tradespeople finishing up the house? In other words, have the 50 who select spray over brush been educated about paint durability? I have this discussion with my customers all the time. I could be wrong but I suggest to them that cabinet shops advocate for spray because it is expedient. All I have to do is point to a two week old dark grey kitchen island with furniture feet to make my case. Like Derek we do an onsite repair. We send out a touch-up can that can be purchased at any Home Depot for $5 thinned 25% with lacquer thinner. We do not install our work, it is expected of the installer to do this work or the GC. On the rare occasion something is dinged or scratched beyond onsite repair we will either make a new one and send it out or pick it up and repair it. Distance from the jobsite usually the determining factor. The fixes are sufficient in most all instances with only the rare lighting situation that causes a complete reshoot of that particular door/part. It happens we try to recoop the costs when possible. Again, I like the brush marks Tim. It is simply a matter that most of my clients do not. In fact the most common request when a paint grade job is sought is a "flawless sprayed finish." I worked in a Cabinet Shop as a Finisher and was quite impressed with the way they made their doors. It allowed for a crack free joint finish. Here's what they did. They undercut the thickness of the dado on the styles and rails. They used 1/4" material for the panels, but prior to gluing up the door, they ran a shop made slot cutter all around the center edge of the panel....about 3/4" deep.Slot cutter was about 1/16" thick. Never used Dap Caulking in that shop, but in other shops; yes. Take a tube of Dap...cut off the bottom of it and squeeze all the contents out onto a piece of glass or P-lam. Color the Dap to closely match the final Paint color. Put all the Dap back into the tube and secure the bottom with Duct Tape so it wont leak. Trim a small portion of the tip off at an angle. Commence with proceeding the finish schedule. I guess my response to your last comments would be that both types of finishes will require maintenance. My 2 week old island and your 2 week old island are both going to have their corners kicked. Are your customers really going to keep a can of Satin Impervo on the counter and a shrink wrapped paintbrush in the fridge year-round? A more likely scenario is that once every year or two the wealthier clients will hire someone to do some touchup, and the more practical ones will attemp it themselves. When this phone call comes, I send out a quart of pre-catalyzed conversion varnish for the professionals, or a small bottle of touchup for the homeowners. But I'm also going to re-frame this argument. Our finish shop revenue alone is about $400,000 per year, putting substantial profit in my pocket. How much income do you generate from your finish shop? Giving away the finish, regardless if your argument is right or wrong, is not an option. Just a clarification, I'm just a Robert and not the Robert from 3nails woodworking. For what it's worth, we work with any medium. We're spraying Satin Impervo in the shop right now as a matter of fact, and last week sprayed some overpriced Farrow & Ball that a naïve homeowner got suckered into. But by and large, I believe that conversion varnish presents to the owner the best value as far as durability and cost is concerned. And as a part of that, I like to steer them away from caulking. The attached image is what I like to see. A systems based response will help you get out in front of this issue. It's one that's not going to go away so is worth some investment of time. Produce two identical doors and caulk one of them. Apply identical finish to both of them so your customer has a basis of comparison. This visual information, in combination with the difference in price for each option will help you get paid for your efforts now and eliminate surprises later. If you want to really make the problem go away repeat the process but this time rake a side light across the face of both doors. The side light will of course highlight every defect. You want to then correct every defect until the door looks perfect under any lighting condition. With these four samples you can articulate the fact that your pricing is for a product that looks good from four feet away under normal lighting. Your customer is not going to be enjoying these cabinets from the vantage point of having a flashlite raked across the face. You should not have to deliver this quality standard. The side light inspection, however, is not going to go away. There will always be a contractor or designer who wants to demonstrate value to the client by "inspecting the work" on their behalf. Our program is very simple. We furnish the customer the first roll of blue painters tape for $100. We are happy to keep painting and fixing until the customer is happy, but anything inspected with a side light costs $100 a roll and $100 per hour.